Yes, it's true. I'm a Philhellene. I have been most of my life...it started when I was still a kid. 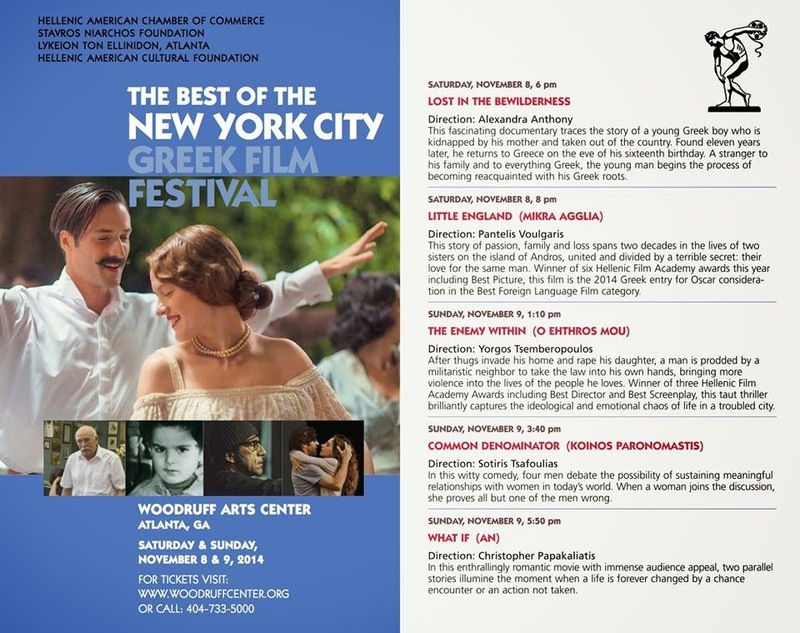 That's why I want to share with you the upcoming event "The Best of the New York City Greek Film Festival" at the Woodruff Arts Center on Saturday and Sunday, November 8 and 9, 2014. What's a Philhellene, you ask? It's "a lover of Greece and Greek culture", a designation I was gifted earlier today. Some of you already know that I lived in Greece for more than two years, when I was 19-21 years old...what a great time that was! But I was well-versed in Greek Mythology at a much younger age. So that I ended up living in Greece wasn't purely happenstance. I'll tell you more about that experience in just a moment, but let me tell you about the upcoming film event. The Best of the New York City Greek Film Festival will take place over two days and will feature five films. One of those films, Little England, is up for an Oscar for Best Foreign Language Film at the 87th Academy Awards on Sunday, February 22, 2015. The films in this festival are primarily in Greek, but with English subtitles. When I lived in Greece and went to the cinema, I remember seeing a comedy that was in English with Greek subtitles and there were two rolls of laughter with each punchline...one when the English-speaking audience heard it and a second when the Greek-reading audience read it. I had long been fascinated by linguistics, so that was a fascinating experience. Funny side story...I had a roommate years ago who didn't care very much for foreign-language films. I love them, so when I wanted a little time to myself, off to Blockbuster I went to rent a foreign film to soon enjoy a couple of hours of me-time. Selfish? No, not at all...we all need a little me-time from time to time, right? Many of us have heard about European culture...how, when visiting a European country, you might be invited into someone's home, treated to dinner, or share a drink...hospitality at its finest. I experienced all of that first-hand. My first Christmas in Greece a friend of mine invited me to his home for Christmas Eve. His mother and father, once they learned I had no family there, insisted that I stay the night and share Christmas Day with them. My time in Greece is filled with wonderful stories similar to that experience. I'll always have a place in my heart for Greece and her people. A gracious "Thank you" to my friends at Lykion Ton Ellinidon Atlanta for letting me know about the film festival (tickets). I'm looking forward to seeing you and to seeing some fantastic cinema!